I have been going to the Hillcrest Berry Farm since I was a teenager. 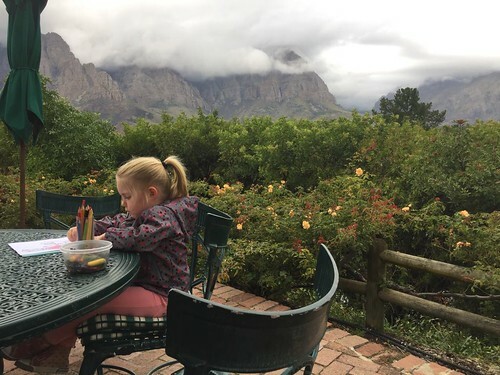 I have fond memories of scones and tea with my family in the beautiful sunshine surrounded by breath-taking views of the mountains. It remained a firm favourite in my student days at Stellenbosch University, nurturing large coffees and berry-drizzled baked cheesecake during study breaks. Now, bringing it full circle, I love taking my husband and children there whenever we get a chance. 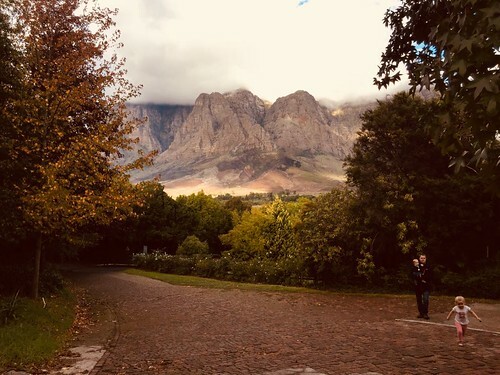 As you leave Stellenbosch and start ascending the steep Helshoogte pass, it feels like you are entering another world. Verdant green vineyards cover every mountain slope and the Banhoek valley. Beautiful manor houses sit nestled amongst the offering of the land and the mountains – harsh, majestic and proud – tower over it all. A little, easily missed sign, takes you off the main road and up a steep drive to the Hillcrest café. 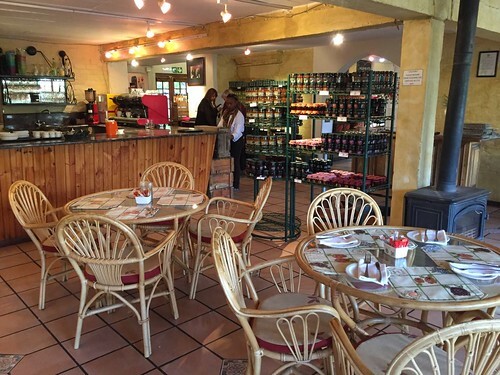 It seems quite unassuming at first, a warmly lit farm shop filled with jams, preserves and home made goods, until you walk out onto the terrace and the view stops you in your tracks. The terrace is bordered by hedgerows of flowers and roses, creating a perfectly fragrant frame for the mountainous backdrop. During our most recent visit, the weather was cooler, given the season, but it didn’t deter us. There are seats indoors as well, should you want that option. However, we enjoyed seeing the low lying clouds over the mountains as it created a moodier, refreshingly different atmosphere than what you usually get during the summer months. It is definitely a café/restaurant equally suited to families with children as it is to travellers/visitors without children. Children are entertained with colouring in sheets and crayons. High chairs are available on request. The terrace is spacious enough for children to play around the tables, but there isn’t a lawn area due to the mountainous location. 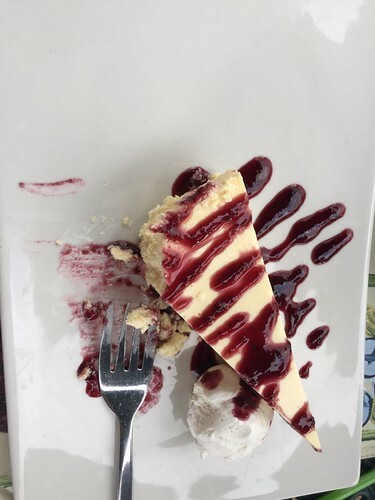 During our recent visit I enjoyed their gluten free cheesecake with blackberry coulis, our daughter tucked into the scones complete with clotted cream and strawberry jam and my husband had a steak! So there is something for everyone. The previous time we visited we took my British in-laws and they not only loved the views and the atmosphere but loved the food. The bobotie, burgers, and poached pear with goats cheese salad was wonderful. Several items on the menu include berries from the orchard, the berry smoothies are particularly good! You can buy fresh berries in the shop during summer and bags of frozen berries are available all year round. Their home-made ice cream sold in the shop is delicious and their jams and preserves are famous – often found in hotels and restaurants across the country. Whether you choose to go on a sunny crisp autumnal/winter’s day or wait for the warmer summer months – just make sure that this little place remains on your list of ‘must do’s’. It is worth it and like me, you will be going back for years to come – it’s visiting an old friend but one with a world-class view!